Valdosta City Council member Tim Carroll will speak tonight at the monthly WWALS Watershed Coalition board meeting at 7:30 PM at the IHOP in Adel (exit 39 from I-75, 1200 W 4th St, Adel, GA, 229-896-2662); the public is invited. In advance he sent the appended letter from the City of Valdosta to the Army Corps of Engineers requesting assistance related to flooding and droughts. Over the last several years, the City of Valdosta and neighboring communities have been severely impacted by the increase of flood events that have occurred throughout our region and particularly the drainage basin we are located in. The city recognizes the various levels of responsibility throughout government agencies for flood management and flood control and is interested in furthering the discussions to understand the changes that are occurring and to ensure the protection of our communities from future flood events. that 1,875 homes and 29 businesses were affected by floodwater, resulting in approximately $60 million in public infrastructure damage. In September 2009, after a week of rain, 17 counties in north Georgia were also declared a federal disaster after major flooding. We understand that a number of factors must be considered when evaluating a flood event, such as soil type, impervious area, intensity and timeframe of rainfall, to name a few. There are also a number of data resources that can assist with planning and implementation, so that our natural and built environments can co-exists. The City of Valdosta has taken numerous strides to minimize the negative impacts of development through local ordinances and regulations, along with other communities. However, a significant amount of the resources, including digital data, that are used as a baseline for planning and development are based on information collected 20-30 years ago and do not reflect the significant growth that has occurred in Georgia in recent years. Since 2009, the city has actively utilized a number of resources to help explain and address our flooding concern. This has included meetings with state legislators, participating in the Suwannee-Satilla Regional Water Planning process, encouraging our neighboring communities to as well, making presentations to state agencies and state leaders, and partnering with the Southern Georgia Regional Commission to host a regional watershed meeting for the Suwannee-Satilla watershed basin. Our efforts have brought awareness, but not results. Preliminary analysis shows that Valdosta sits at the bottom of an approximate 1500 square mile drainage basin. The flood events that have occurred demonstrate the need for an appropriate agency to take the lead to conduct a comprehensive study of the drainage basin. Such a study could identify causes, solutions, and the role of federal, state and local governments to implement these solutions. 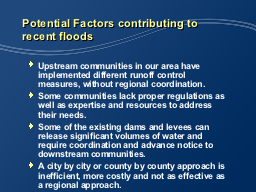 We believe solutions will require, among other solutions, strategically placed regional reservoirs to manage and control the flood events that are occurring at a frequency that is alarming. The homes and properties of residents in our city are being impacted and many live in fear of weather forecasts that predict major rainfall. 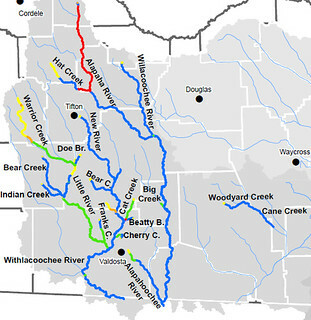 Most difficult is the fact that the city of Valdosta makes up 1% of the watershed of the Withlacoochee and Little Rivers, which are part of the Suwannee Basin. Rain events as far north as Crisp County and all those regions south negatively impact our city and its residents. While no portion of the Withlacoochee and Little Rivers run through our city, we are nevertheless the most affected community by the flooding that is taking place from these rivers. This is not a problem we can resolve locally without the assistance of agencies such as yours, the Georgia EPD, other cities and counties and many other parties. The U.S. Army Corps of Engineers is an established organization with extensive knowledge related to infrastructure and water resources. As a result, we would like to request a meeting with you to discuss the challenges faced by our community and the recommended steps needed to reduce future flood events, while also preserving our natural environment. We understand that additional local, state, and federal organizations will need to be involved and are willing to coordinate with the necessary resources. Our goal is to have your agency undertake a study of the drainage basin and help develop a plan to resolve the flooding. I look forward to your favorable response to meet and begin the process of identifying stakeholders and initiating the necessary study to work together to find solutions. I am enclosing several documents that show the efforts the city has made to this point and hope they will assist in understanding the problem, as well as the opportunities for solutions. Please contact me at your earliest convenience at (229) 259-3500. Here are copies of those attachments, with a few notes. Based on the EPD website, there are 105 cities and 39 counties that are permitted by the State through the Phase I or II programs. These federal regulations have helped to implement stormwater measures across the state; however, every community is impacted by stormwater and a large number of communities in Georgia are not taking appropriate measures to address the long-term impacts. By implementing a regional approach, this would help to streamline stormwater management through consistent control measures, regulations, and provide a more cost-effective approach. Through the proper evaluation, a series of storage areas could be identified to control stormwater flows, while providing additional benefits such as water quality, water quantity, and additional water supply. To implement such measures, the coordination between local, state and federal organizations is critical. In anticipation of approval, the city has purchased 75 acres adjacent to the existing plant, outside of the 500 year flood plain, for $1 million dollars. The Water Supply Act offers a unique opportunity to address water supply for agricultural needs and low flow conditions and to address storm water issues. How will growth and water use affect water resources? Increase in impervious areas over the years throughout the region. Different runoff control measures implemented, without regional coordination. Some of the existing dams and levees can release significant volumes of water and require coordination and advance notice to downstream communities. Identify storage areas to control storm water flows, while providing a much needed water supply reservoir network (e.g. agricultural needs and low flow conditions). Utilize recharge areas, combined with stream buffers, to reduce the stream flow and recharge the aquifers. Seek State and Federal funding to implement the solutions that are beyond the legal, financial and institutional capacity of any jurisdiction in the watershed (e.g. The Water Supply Act). This entry was posted in Board Meeting, River and tagged Adel, Alapaha, Alapaha River, Army Corps of Engineers, conservation, Cook County, disaster areas, drought, Federal Emergency Management Agency, FEMA, flooding, Georgia, John S. Quarterman, Little, Little River, Lowndes County, north Florida, planning, river, south Georgia, Suwannee-Satilla Regional Water Plan, Tift County, Tifton, Tim Carroll, Valdosta, watershed, Willacoochee, Withlacoochee, Withlacoochee River, WWALS, WWALS Watershed Coalition on March 13, 2013 by jsq.